a safe place to ask questions, make beautiful mistakes and have fun! 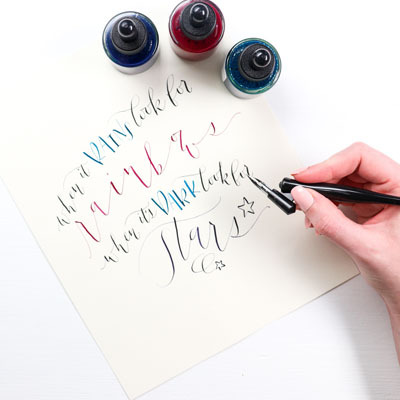 This Online Calligraphy Course is perfect for the hobbyist, the entrepreneur, and the creator. This is the calligraphy course that breaks it down into easy, doable steps, with hours of video training and over 100 pages of printable Calligraphy Worksheets. I’m Erin, the owner, designer, and creator of this little design haven called Printable Crush. 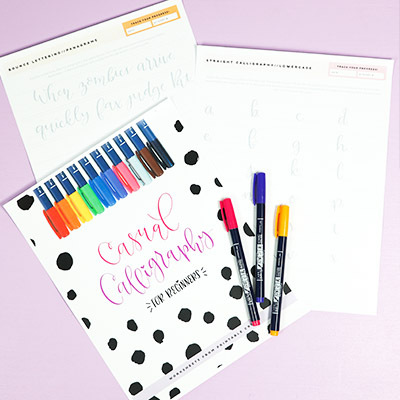 You may know me for my free printables, Cricut Tutorials, and party ideas, but at the foundation of all of those things is my love for Hand Lettering and Calligraphy. 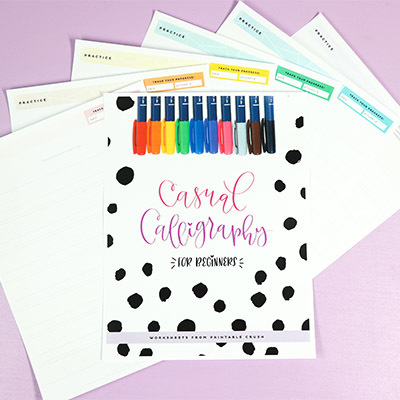 When I started lettering 4 years ago, I never would have thought that I would be creating hundreds of hand lettered printables, SVG files, and worksheets that thousands of readers see EVERY DAY. I'm even a brand ambassador for my FAVORITE lettering pen company, Tombow. But here I am, teaching you my ways, friend. I'm here to help you learn and grow. Learn the proper stance, how to hold your pens, and where to buy all the supplies you'll need. in slanted letters and straight letters. Take those letters you learned in module to and give them some bounce styling! Try out different styles and calligraphy techniques to make your lettering unique! Add even more fun elements to your design with dozens of embellishment ideas. All the modules come together as you learn to create a final composition! This course is completely self paced...purchase the course and don’t have time to finish it for a week...a month...5 years? No worries...you can get back to those calligraphy drills ON YOUR TIME. I would never want you to be unhappy! Email me your concerns in the first 30 days of your purchase. If you're still not satisfied before the 30 days are up, I'll give you a full refund. 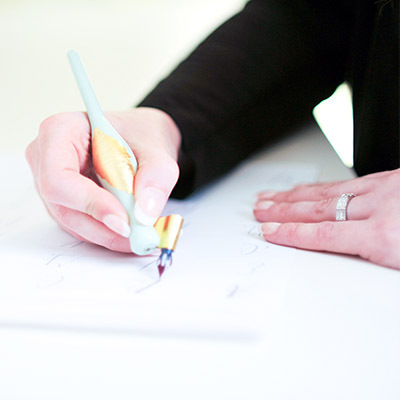 Beginner to intermediate Calligraphers will benefit the most from this course. 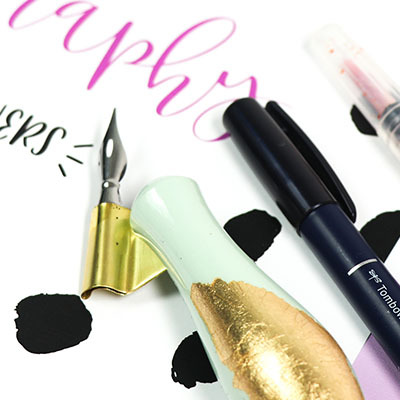 If you have tried hand lettering, and want to give calligraphy or brush lettering a go, this course is definitely for you! Will I be able to write in Calligraphy after this course? With practice? Absolutely. 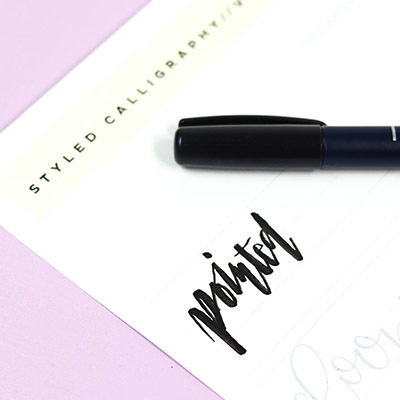 While I can't guarantee results because everyone is different, I will tell you everything you need to know to be able to create with a calligraphy pen and brush pen.